Ten years ago, the nation watched the near-total destruction of New Orleans, one of its most historic cities. New Orleans' lifeblood – its citizens – was pushed out by floodwaters, as its poorest residents clung to the city’s sliver of high ground or rooftops that protruded from the dark, polluted waters. As the city lay almost lifeless for weeks in a sort of induced coma, pundits and politicians began discussing the futility of rebuilding. Some wondered: had the bell tolled for the city of Andrew Jackson, Louis Armstrong, Ruby Bridges and the Saints? A decade removed from the epic failure of its federal flood protection system, New Orleans' rebirth is remarkable. About 80% of the pre-storm population has returned. Dozens of neighborhoods have been revived. A new US$14.6 billion flood protection system guards against future major storms. An infusion of entrepreneurs and young professionals place New Orleans at the cutting edge in such areas as education and sustainable building practices. The most extraordinary part of this revitalization is that the recovery was cultivated largely by courageous residents, generous volunteers, determined grassroots neighborhood organizations, risk-taking small businesses, enterprising nonprofits and innovative philanthropic funders. But there’s another story of New Orleans' long-term recovery, a narrative of tough redevelopment challenges and precipitous or problematic policy choices around disaster recovery. Some of the city’s outlying neighborhoods are still struggling. Crime rates remain high. A significant number of African-American families worry that the new charter school systemisn’t serving their children well. Low- and moderate-income African-American families struggle to rebuild their homes hampered by historic blight or the zombie-like persistence of storm-damaged homes. This 10th anniversary is a reminder that long-term disaster recovery is excruciatingly difficult work for communities and their leaders. This is old news for New Orleans; however, the tremendous adversities associated with long-term recovery are dramatically underscored by ongoing recoveries from Colorado’s 2013 floods, New York and New Jersey’s troubled Superstorm Sandy response, Vermont’s 2011 Tropical Storm Irene recovery and Iowa’s rebound from devastating 2008 floods. The shortcomings of New Orleans’ recovery and the challenges faced by its sister cities – big and small – from Longmont, Colorado, to Cedar Rapids, Iowa, to Hoboken, New Jersey, leave room for improvement. It may not be realistic for disaster-torn communities to expect a smooth long-term recovery. But it is neither necessary, nor just, for recovery to be impeded by rigid federal laws or regulations unsuited to large-scale disaster recovery and state or local governments that lack essential capacities to support neighborhood redevelopment efforts. 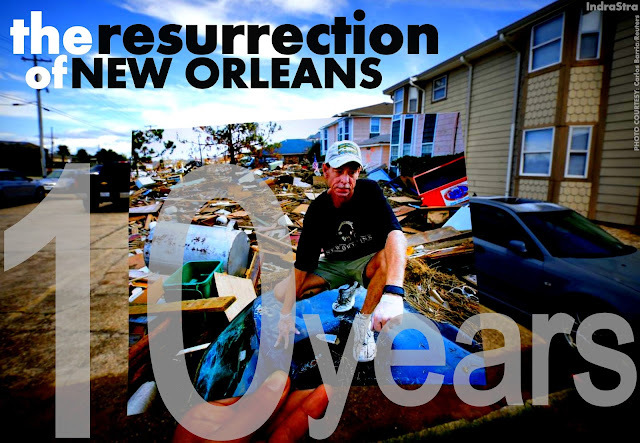 If hindsight is 20/20, then we have a privileged glimpse at New Orleans' long-term recovery. This is a view that key city stakeholders everywhere, including policymakers, community development nonprofits, businesses, philanthropic organizations and grassroots citizen groups, should want to capture. But it is important to see beyond just the glossy success stories. Mindful of the Katrina recovery’s serious shortcomings, these stakeholders must examine the closely related questions of how to reduce our cities’ vulnerability to disaster and what steps can be taken to reinvent cities in a way that promises a more equitable future for all citizens. address the long-term impacts and implications of population displacement in impacted and host communities, such as Houston. In their book “Displaced by Disasters: Recovery and Resilience in a Globalizing World”, authors Ann-Margaret Esnard and Alka Sapat document how displacement complicates community recovery, and, among other recommendations, make a case for further research on conceptualizing and measuring households’ predisposition to displacement. The good news is that these stakeholders are coming together. The US Department of Housing and Urban Development, the Rockefeller Foundation, Living Cities Inc and others are pursuing initiatives to build local capacity and deploy smarter policies to bolster city resilience. “New Orleans could be the greatest comeback story since Lazarus,” quips Tulane professor Peter Ricchiuti. That may well be true, but as a country we don’t want to count on another miracle of urban recovery. And we don’t have to if we invest now in prudent planning for city resilience. In an era when climate change, sea level rise and economic disasters such as the mortgage foreclosure debacle constantly place our cities in the crosshairs of crisis, we need to ensure the playbook guiding our cities’ strategic development decisions includes options that allow all our citizens to rebound quickly and equitably from disaster. John Travis Marshall served as a Rockefeller Foundation Fellow from 2007 to 2009. Ryan Max Rowberry is Chairman of the Board for Presonomics, a non-profit dedicated to promoting the economic benefits of saving historic places.